The SJK Carbine 2500 tactical hunting backpack is designed with versatility in mind — it’s big enough to carry a lot of gear but small and compressible enough to take anywhere. 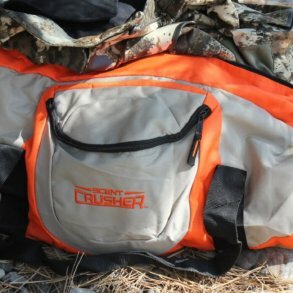 Plus, its pocket system gives you easy access to core hunting gear, including a handy pocket that will hold 12 rifle rounds with its built-in elastic loops. 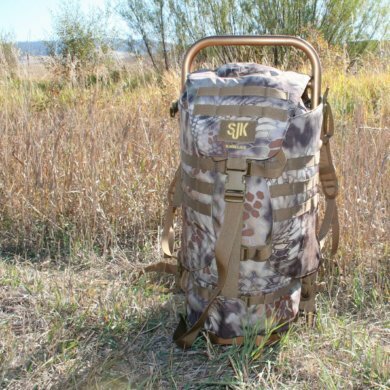 The guys at SJK seem to know that a hunting backpack can make a good rifle rest for those moments when you need to throw yourself on the ground and go prone for a long shot. 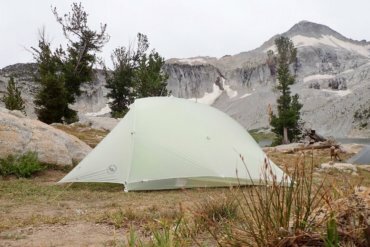 The Carbine 2500 is wide and stable and will likely be the right size when filled with gear. Every big game season I find myself down on the ground using a pack this way — even when I decide not to shoot. So who is SJK? 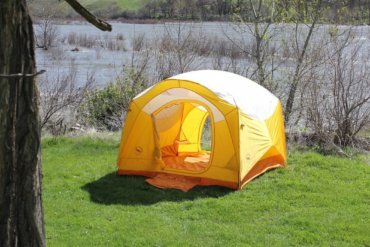 SJK is a brand moniker for Slumberjack — the company known for making plush sleeping bags and other camping gear. 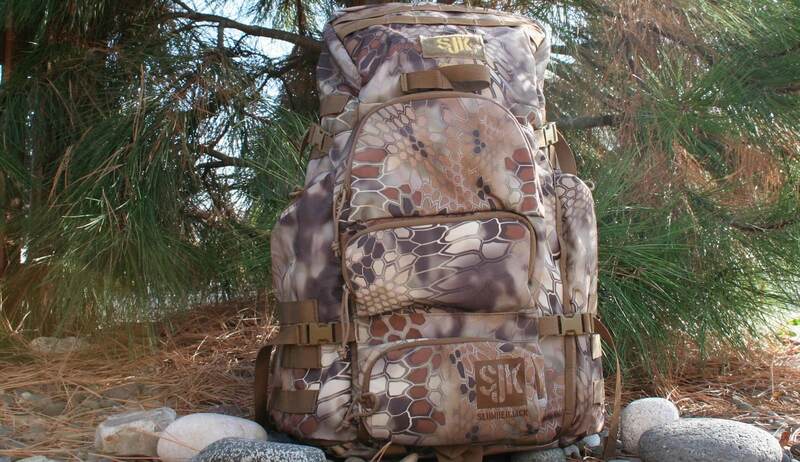 The SJK line launched a couple years ago along with SJK’s tactical hunting backpacks. 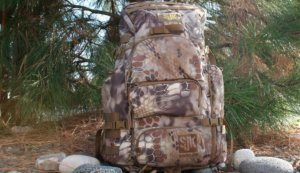 SJK Carbine 2500 hunting backpack blends the best of a light daypack with the versatility of a hauler. Check it out at Amazon. One of the standout features of the Carbine 2500 is its Kryptek camo pattern. 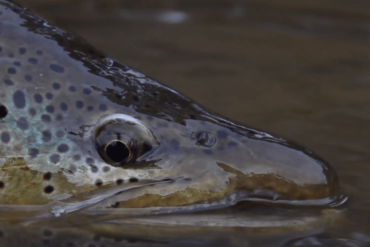 In shades of browns or tans, the pattern looks vaguely insect-like, but it’s undeniably cool. Plus, the pattern grows on a guy — I like it the more I see it. Is it any more or less effective than other camo patterns? I don’t know. Either way, I’ll end up using some of the extra gear loops to to attach some lengths of orange paracord. Why? If I can create a few spots of orange on this pack, it should help signal that this brown camo shape crawling through the brush is actually something human. (Obviously, smart hunters won’t shoot at what they can’t identify, but I’m not worried about the smart hunters.) 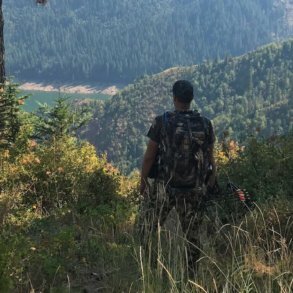 During rifle season, I like to attach a few extra pieces of hunter orange to a camo pack, and I recommend that other hunters do, too. Back to the pack. There are a lot of good things to talk about here. Overall durability looks great — the fabric seems to have excellent stitching, and it seems to have a nice blend of strength while also being supple. Zippers are smooth. The Carbine 2500 has twin side pockets for packing optics, a bipod, shooting sticks, or whatever you want to secure in the large pockets — or even between the pockets and the main body of the pack. Inside the roomy main pack, there are two narrow pockets with a pair of clips for your auto or ATV keys. Under the lid, there’s another pocket with yet another clip for your keys — or whatever small and important piece of gear you don’t want to lose. The shoulder straps are well-padded without too much bulk — I can put my rifle to my shoulder and not worry about the strap getting in the way. The sewn in hip belt is similar — nicely padded. It offers good support for heavy loads — but not enough support for seriously heavy loads packed for a long period of time. First impressions? 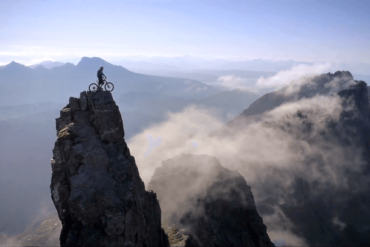 You could drop 30 pounds into this pack and it’ll ride nicely all day. 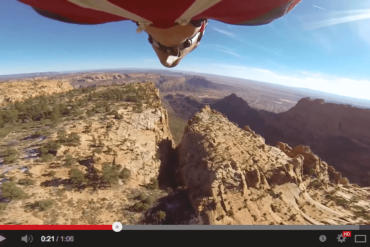 If you go much heavier, you’ll probably want a more adjustable and supportive experience. For short-term loads, though, I can easily imagine trusting the integrated trophy carry system, as long as the pack isn’t already heavy and full. And what’s that? On the outer back of the back, the exterior pocket flap will extend out, letting you strap in a deer quarter or maybe a small elk quarter. 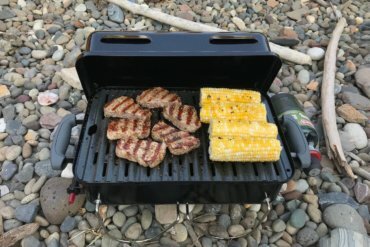 Depending on your own size, strength, and distance, what I like about the Carbine 2500 is that you can use this pack to haul out meat if you end up getting far off the beaten path. Even if you’re just a few hundred yards from an ATV, the Carbine looks capable of overloading to get the job done. 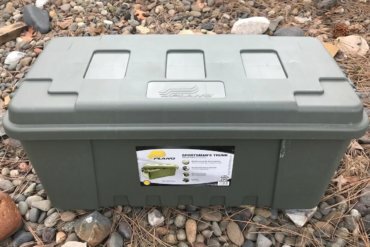 Obviously, if you’re willing to bone out an elk in the field, you could load up the interior of this pack with acceptable results. My recommendation? 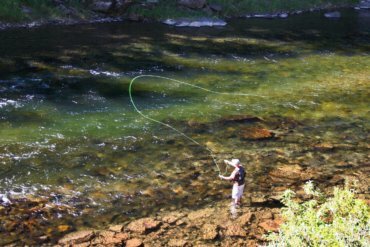 For big loads — or a lot of them — I would steer a buyer toward a pack with a more rigid frame system that has more adjustable positions for the shoulder straps and hip belt. 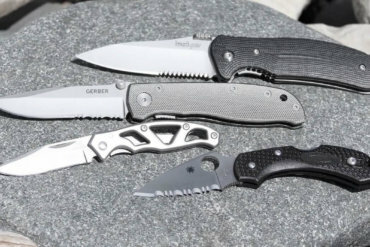 The Carbine 2500 is designed to fit a 17.5-to-19.5-inch torso, which covers most men, but if you’re a 6’6″ guy or you have a long torso, the hip belt may ride too high. An alternative bigger pack from SJK — which also compresses down small for quick hunts — is the SJK Rail Hauler 2500 (check out our Rail Hauler 2500 review here). The rear pocket flap I mentioned above will carry a bow, but there’s also a rifle carry system built-in. A pocket unfolds from the bottom of the pack to hold the stock of your rifle. The barrel is secured by a strap in the middle near the top of the pack. The system is adjustable, so you can play around to get the fit you need for your circumstances. The hip belt, by the way, also includes a strap for a sidearm holster if you pack a pistol with you. 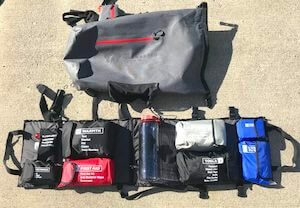 The pack is — as you would expect with any modern pack — compatible with hydration systems. The Carbine 2500 is designed to function as a wide and stable rest for prone shots. The Carbine 2500 includes a handy pocket for 12 rifle rounds. The straps are padded, but not too large to get in the way of a rifle at your shoulder. The interior slip pocket includes clips for keys. The side pockets also give you a spot to strap in larger items. 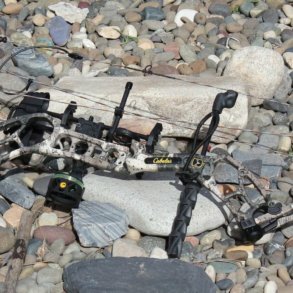 The rear pockets extend down to provide room to haul a bow or a deer quarter. The integrated rifle hauling system is adjustable. Oh, and does the Kryptek camo blend? It sure does in this shot. The new Slumberjack brand — SJK. 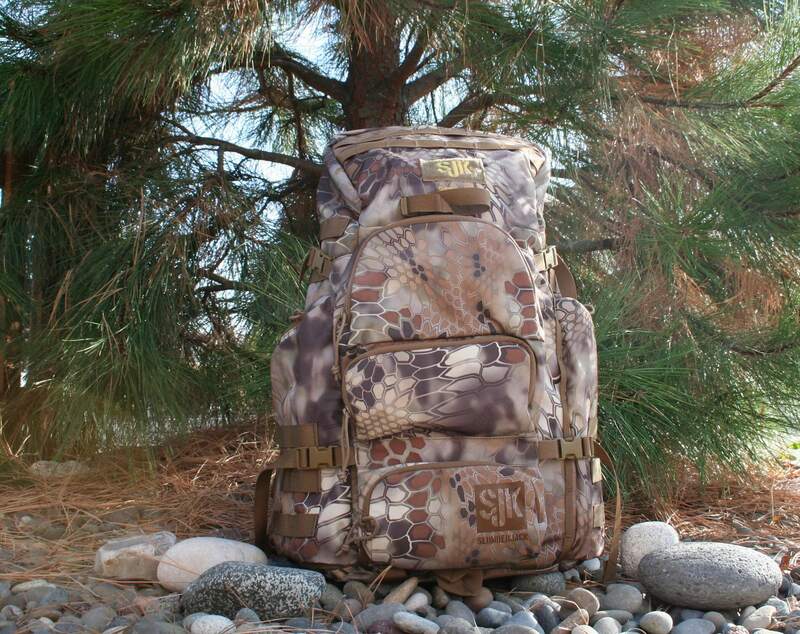 The SJK Carbine 2500 blends the best of a light daypack with a versatile hauler. All-in-all, the SJK Carbine 2500 has the promise of a great pack — we’ll post a longer term review after using the pack in the field this year. In the meantime, I don’t have any hesitations recommending it for hunters who are looking for a versatile pack that you can overload as well as compress down so you barely know it’s there. 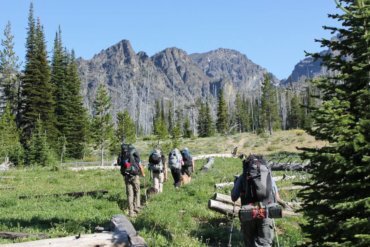 It’s the kind of pack that can give you the confidence to go down deeper into holes or higher up on mountains than you’ve gone before. The fit and finish is excellent, the Kryptek camo pattern looks fantastic, and I’m willing to trust the Carbine 2500 to go a few miles off the beaten path — and return loaded with even more. Carbine 2500 — Blends the best of a light daypack with a versatile system that will let you carry a lot of gear . . . as well as add on a deer quarter . . . see it at Amazon. Rail Hauler 2500 — Combines an aluminum frame with a removable pack for heavy loads. 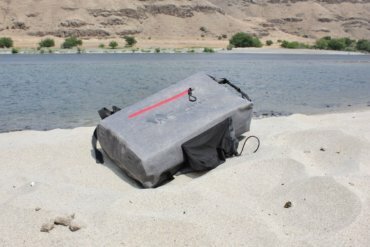 The system also lets you use the fabric pack portion as a day pack, without the heavy-duty frame. It’s a sweet system . . . see it at Amazon. Snare 2000 — If you know you need a little smaller pack, the Snare 2000 could fit. It has straps to let you haul out some light meat loads, too . . . see it at Amazon. 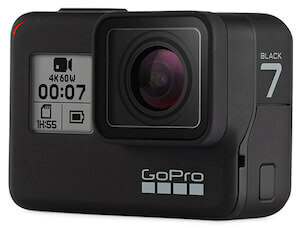 Bounty 4500 — A full-size pack for multi-day hunting . . . see it at Amazon. Flush 750 — Hip belt with shoulder straps . . . see it at Amazon. Rifle Hauler Mat — Protects your rifle . . . see it at Amazon. 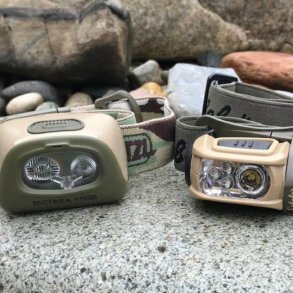 Need a hunting gift idea? 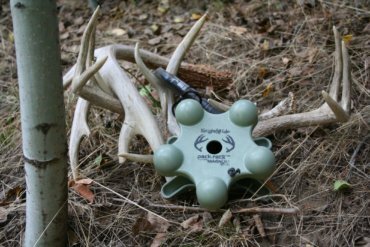 Check out our Best Gifts for Hunters guide.